Showing on a regular slot on the Disney Channel, Special Agent OSO is one of the coolest programmes on kid's TV. He’s a special agent panda bear (not quite like James Bond 007) and is always helping kids out with all of their day-to day-problems. Simple things like tying shoe laces or learning to dry dishes are where OSO comes to the rescue. Dressed in a smart outfit and wearing a medal and a watch, Special Agent OSO interrupts his daily spy activities to help out anyone in trouble. OSO uses a variety of vehicles to get around - and Tomy make a series of Special Agent OSO toys for distribution throughout the UK. The biggest and best of these is the Rapide Command Centre that can be extended to nearly 3 feet long! Plenty of lights and sound plus a launcher are included in this amazing toy. OSO’s Whirly Bird comes complete with OSO in his flying gear, as well as a winch and ejector seat. As well as being poseable, all Special Agent OSO characters have cleverly hidden magnets sealed inside them, and these are used to activate various working features on the vehicles and playsets. OSO works for U.N.I.Q.U.E. - the United Network for Investigating Quite Unusual Events, and together with his team of friends he tackles all of the kid’s problems. 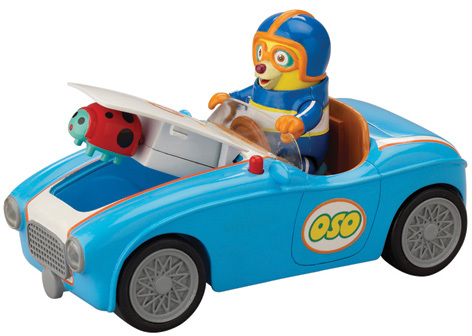 Special Agent OSO toys also include a Moonrover, Go Go Racing Car and a Motorboat as well as packs of figurines including OSO, Wolfie and Dotty.